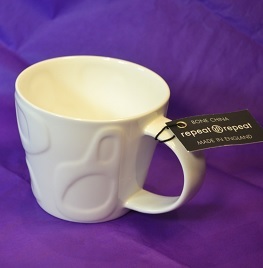 Beautiful range of Fine White bone china mugs, made in Stoke-On-Trent by Repeat Repeat. Delicate imprinted designs to go with every kitchen decor. They are beautifully crafted and lovely to hold a generous steaming cup of coffee in. This one is a conical Tubby-Shapes with quirky casual shapes embossed. Approx capacity 350ml.